Maddie the HERO!! Maddie is a 10 year old Lab who is trained as a TOUCH dog. 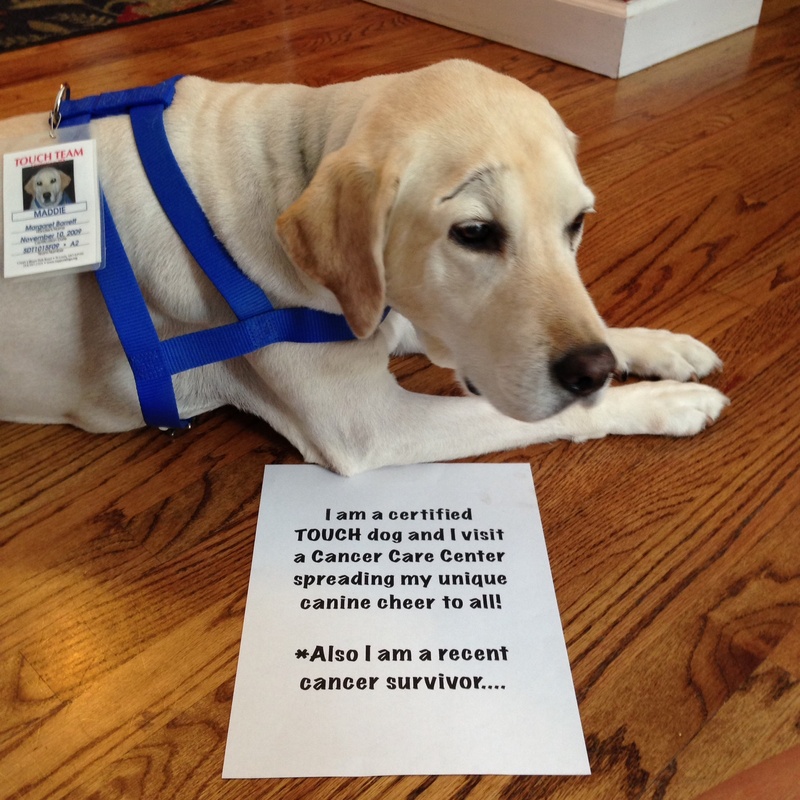 She visits patients receiving chemotherapy at a local Cancer Care Center and spreads her canine cheer…. She is recent cancer survivor as well (notice the scar above her eye)! What a wonderful dog! And I’m sure she is very empathic, having gone through cancer herself! God bless our furry angels! Maddie is most definitely a hero! She melts my heart..love her. What a good doggie! I hope she lives a long life helping others. Good for her! What does TOUCH stand for–is it a form of therapy dog? Awwww, what a sweetie-pupper! 🙂 Good girl, Maddie! I had to comment.. My father-in-law is currently battling a cancer that spread throughout his mouth and throat, and has been making regular trips to the Cancer Treatment Center of America in Tulsa, OK. While he and my mother-in-law rave about the staff they have there, I’ve heard so many stories about the therapy dogs that have come through. How every single one has brought smiles to faces of everyone going through treatment. How amazing these dogs are to see especially on tough days. Maddie is an angel to be bringing cheer and calm to those going through cancer treatments, and no doubt, they feel connected to her knowing she’s gone through her own battle, and come out strong. What a good dog! I bet she brings a lot of comfort and joy. You sure are a hero, Maddie. May you have many more cancer free years spreading joy to your family and cancer patients. You rock! Love Love Love this!! Maddie is awesome! Love love love this photo in so many ways! Saw it on Dog Bless You and followed it here. I’d like to ask the owner of the shot if I can re-print it in a local magazine (issue devoted to Health)? Please let me know. Thanks in advance.